As expected, the fourth edition adds new short stories, nonfictions, poems, dramas and drops some of the ones in the third edition, keeping the overall page count of the book about the same. The new stories added are by Tobias Wolff, Jamaica Kincaid, Ursula Le Guin and others; new examples of creative nonfiction are from Michael Chabon, David Sedaris, and others. Also new are nearly half of the poems and dramas. Some of the “new” additions are from the most widely anthologized, for example, Tobias Wolff’s “Bullet in the Brain,” Ursula Le Guin’s “The Ones Who Walk Away from Omelas,” and Jamaica Kincaid’s “Girl.” That’s good for beginners: if you haven’t read them before, they are great additions; good for instructors: if you have read them before, they cut down your preparation time. In the Revision section, Burroway wisely retains an example from her own work because only the author can authoritatively know her changing intentions in the re-drafting process. Does the fourth edition obsolete the third? No. If you are studying the book on your own, the third edition might be a better choice — less expensive used book. For a brief comparison with the earlier editions, please read on. 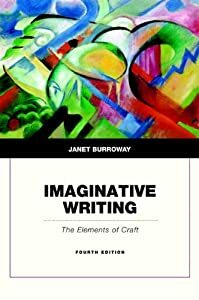 Janet Burroway’s “Imaginative Writing: The Elements of Craft, 3rd Edition” adds several new short stories, nonfictions, poems, dramas and drops some of the ones in the second edition, keeping the overall page count of the book about the same. Notably enhanced are the chapters on drama and on poetry. The drama section includes several examples of a newly popular genre, the ten-minute play. Although marketed as a textbook for Creative Writing 101, this book can serve as an excellent primer for self-teaching. On completing the brief “try this” exercises included, you’ll acquire a good understanding of the craft elements and be able to judge whether the comments on your work by other apprentice writers in a workshop or your friends are on the mark or not. Beware that even positive, flattering comments (“I loved this image…”) can mislead you. Unlike the reviews to date, my review focuses on the current edition, not the first edition. The overall organization of the book is unchanged. The first part comprises chapters on the five elements of craft common to all genres of imaginative writing: Image; Voice; Character; Setting; Story. The second part comprises chapters on the four genres: Creative Nonfiction; Fiction; Poetry; Drama. Among the new examples in the second edition are the following: contemporary short stories such as Jhumpa Lahiri’s “Interpreter of Maladies,” William Trevor’s “Sitting with the Dead,” Ron Carlson’s “Big foot Stole My Wife”; contemporary poems by Billy Collins, Annie Tibble, and Henry Reed: contemporary creative nonfiction by Gayle Pemberton, Bill Capossere, and William Kittredge; contemporary drama by Carol Real, Jim Quinn, and Josh ben Friedman. Also new are a series of developmental exercises, located in the basic techniques section at the end of each chapter. This series is designed to facilitate readers “toward a finished” draft of a short story. Its unique multigenre approach, lucid expositions, and “Try This” prompts make IMAGINATIVE WRITING the best primer for teaching yourself.